The development of widespread fatigue damage (WFD) in airplane structure is a concern for older airplanes. The U.S. Federal Aviation Administration (FAA) has published a rule that will limit the commercial usage of older airplanes, requiring service actions to preclude the onset of WFD and retirement. Operators will need to comply with the limits of validity specified in the airworthiness limitations as early as July 2013. On Jan. 14, 2011, a new FAA rule (14 Code of Federal Regulations [CFR] 26 Subpart C) became effective requiring airplane manufacturers to make available service actions necessary to preclude the onset of WFD and to establish operational limits, known as limits of validity (LOV), of the maintenance program that effectively define an airplane’s usable life. It is important that operators become familiar with the rule so they can prepare for changes to airworthiness limitations that will limit how long an airplane may be operated in terms of flight cycles or flight hours. This article describes Boeing’s approach to complying with the new rule and its impact on operators of Boeing airplanes throughout the world. It addresses the imminent future changes to airworthiness limitations, how those changes were developed, and how Boeing will assist operators with rule compliance. 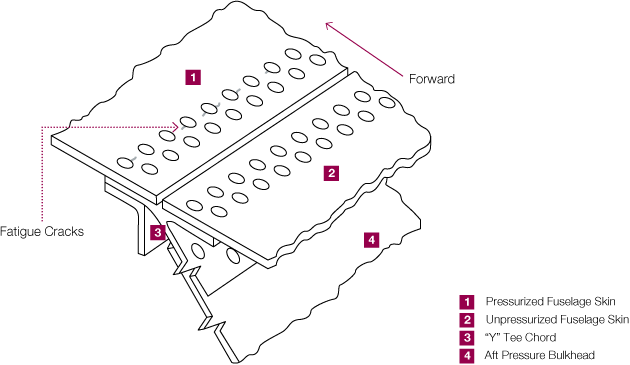 WFD in an airplane’s structure is defined as the simultaneous presence of cracks at multiple locations that are of sufficient size and density that the structure will no longer meet required damage tolerance and will not maintain required residual strength after partial structural failure (see fig. 1). The risk of WFD onset increases as airplanes are operated well past their original design objectives in flight cycles or flight hours. The cracks on this lap splice are an example of WFD. 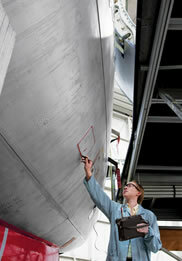 Because of the increased difficulty of identifying all of the necessary service actions and the inability of non-destructive inspections to reliably detect small cracks associated with the development of a WFD condition, airplane manufacturers, operators, and regulatory authorities have worked together to address WFD in aging airplanes. The result was the creation of the LOV concept that effectively establishes the life limit on an airplane based on when the existing fatigue test evidence is no longer sufficient to reliably predict structural behavior (see “Sources of fatigue test evidence” below). Teardown and refurbishment of a high-time airplane. Less than full-scale component tests. Evaluation of in-service problems/test data experienced by this model or other airplanes with similar design concepts. Analysis methods that have been parametrically developed to reflect fatigue test and service experience. The LOV represents an operational limit based on fatigue test evidence that supports the maintenance program. The FAA defines the LOV as “the period of time (in flight cycles, flight hours, or both) up to which it has been demonstrated by test evidence, analysis and, if available, service experience and teardown inspections, that widespread fatigue damage will not occur in the airplane structure.” It is further defined as the point in the structural life of an airplane at which there is significantly increased risk of uncertainties in structural performance and probable development of WFD. Once the airworthiness limitations containing the LOV are approved by the FAA, an airplane may not operate beyond the LOV. The FAA’s WFD rule specifies actions that are required of airplane manufacturers and operators. Develop and make available an LOV as an airworthiness limitation according to a model-specific schedule contained in the rule. Provide any service bulletins required to preclude the development of WFD up to the LOV and publish those service bulletins in accordance with an FAA-approved binding schedule. Incorporate mandatory service actions into their maintenance programs. Adopt the LOV values provided by the manufacturer or, should the manufacturer not provide a LOV, adopt the FAA default LOV values by a date specified in the rule. Have a plan to stop operation of airplanes under Parts 121 and 129 when the airplanes reach the LOV. The FAA rule requires the manufacturer and the operator to comply by certain dates depending on the requirement in effect concerning damage tolerance (14 CFR 25.571) when the airplane was originally certified (see fig. 2). Boeing will provide amended airworthiness limitations containing limits of validity (LOV) to the FAA for each airplane model by the dates shown on this compliance schedule. Group 1 Airplanes The first group of airplanes affected are those certified prior to 14 CFR 25 Amendment 45. Group 2 Airplanes The second group of airplanes affected are those certified between 14 CFR 25 Amendment 45 and 95. Group 3 Airplanes The third group includes all airplanes certified to 14 CFR 25 Amendment 96 or greater. As part of rule compliance, Boeing is required to identify WFD-susceptible areas for both the as-delivered structure and any structure that required modification by an airworthiness directive (AD). Boeing also must predict which of the identified WFD-susceptible areas will develop WFD prior to when the LOV is reached and provide service bulletin actions to prevent that development (see fig. 3). These service actions would be in the form of service bulletins that would require inspection, modification, or both. The FAA will issue an AD to make these service bulletins mandatory. This skin splice at an aft pressure bulkhead is one area of airplane structure determined by the FAA to be susceptible to WFD. To assist the industry in defining areas that might be susceptible to WFD, the FAA, with the assistance of operators and airplane manufacturers, identified 16 generic structural areas susceptible to developing WFD (see “Identifying WFD-susceptible structure” below). All of these areas are explained in the FAA Advisory Circular 120-104. This list is not meant to be inclusive of all structure that might be susceptible on any given airplane model, and it should only be used for general guidance. The FAA with operators and manufacturers documented 16 examples of airplane structure susceptible to multiple-site damage (MSD) and/or multiple-element damage (MED). This list is not meant to be inclusive of all structure that might be susceptible on any given airplane model, and it should only be used for general guidance. It should not be used to exclude any particular structure. While the establishment of the LOV will mandate the retirement of very old airplanes, the service bulletin actions to prevent WFD may present even more significant costs to the airline. Service bulletin actions include inspection, modification, or both and must be accomplished prior to utilization thresholds specified in the associated AD. Similar to the requirements of LOV, operators may not operate airplanes that are past AD thresholds without complying with the AD-mandated inspection and modification requirements. The service bulletin actions for Boeing airplanes were developed with the assistance of the Structures Task Group (STG), which consists of Boeing, operators, and the FAA. The STG was asked to evaluate each proposed service bulletin action and ensure it was of value to the industry. Using this information, Boeing has committed to make service bulletin actions available to the industry to enable operation up to the LOV (see fig. 4). Specific information about each of these bulletins may be found in the Aging Airplane Program Web site on the MyBoeingFleet.com products page under Structures Task Group. This table details the number of service bulletin actions for Group 1 airplanes (certified prior to 14 CFR 25 Amendment 45) that operators will be required to adopt in order to achieve the LOV. A similar approach will be used to develop the compliance data for Group 2 and Group 3 airplanes. Boeing will provide the FAA with updated airworthiness limitations containing the LOV for each airplane model in accordance with the compliance dates in figure 2. Following approval of the airworthiness limitations by the FAA, Boeing will make them available to operators on MyBoeingFleet.com. Operators will need to acquire the documents (per 14 CFR 91.403) and update their maintenance programs and have those programs approved by their FAA principal maintenance inspector by the dates specified in 14 CFR 121.1115 or 129.115 (see fig. 2). For example, Boeing provided the compliance documents to the FAA on July 13, 2012, for the 727, 737-100/-200/-300/-400/-500, 747-100/-200/-300, DC-8, DC-9, DC-10, and MD-80. Subsequently, the FAA approved LOV values for Boeing’s Group 1 airplanes (see fig. 5). Updates to the airworthiness limitations are now available on MyBoeingFleet.com. Operators of Group 1 airplane models have until July 14, 2013, to integrate the LOV into their maintenance programs and develop a plan to stop operation of these airplanes when they reach the LOV. Boeing has also developed anticipated LOVs for the Group 2 and Group 3 airplanes (see fig. 6). These anticipated values are based on preliminary engineering calculations and are subject to final revision before final submission to the FAA. These LOV values are substantially beyond the original design service objectives embodied in the design of the airplanes. These are anticipated values only and are subject to revision. This information was part of Boeing multi-operator message 10-0783-01B, dated Dec. 19, 2010. In the near future, Boeing will begin publishing the service bulletin actions required to preclude WFD for Group 1 airplanes. These Boeing service bulletins will be identified by a statement in the background section of the bulletin. The FAA will mandate each of these bulletins in due course. If an airplane is above a specific threshold in the bulletin, Boeing recommends performing the service bulletin actions as instructed. Boeing estimates that approximately 25 Group 1 airplanes will exceed their FAA-approved LOV by the initial operational compliance date of July 14, 2013. Because the existence of WFD in the structure cannot be reliably detected by maintenance inspections beyond the LOV, Boeing strongly recommends that airplanes above their LOV be immediately and permanently removed from service. However, Boeing will continue existing support policies for these airplanes up to the date when operators are required to comply with the operational rule. With the exception of certain military derivatives, including commercially certified airplanes in military service, Boeing will not provide support to airplanes beyond LOV after the date when operational compliance is required. This includes operations within the United States under any operational rules (not limited to Federal Aviation Regulations Parts 121 and 129), as well as airplanes operated outside of FAA jurisdiction. This also includes the 707/720 model, which has an FAA-defined LOV. This policy will go into effect as of the respective operational rule compliance dates specified in 14 CFR 121.1115 or 129.115. Boeing has several means to keep operators informed of the latest information concerning WFD rule compliance. When significant information becomes available, Boeing will publish a multi-operator message or a service letter. Boeing also has recently introduced an Aging Airplane Program Web site on the MyBoeingFleet.com products page. This Web site is updated on a regular basis and contains links to the current versions of all service letters and multi-operator messages, as well as FAA rules and advisory circulars. It also provides directions for obtaining documents required for operator compliance. Information concerning upcoming STG meetings and Boeing seminars on topics of general interest is also available on the Web site. Concern about WFD increases as airplanes operate beyond their original design objectives. Manufacturers, operators, and the FAA have worked together to address WFD by defining service bulletin actions necessary to preclude the onset of WFD up to the LOV specified in the airworthiness limitations. Operators will need to comply with the LOV specified in the airworthiness limitations as early as July 2013 and to comply with future ADs. For more information, please contact agingairplaneprograms@boeing.com.